Happy 2018 and all the best in the new year to our PURA Community! Home » BLOGCHAIN » Pura Coin » Happy 2018 to the PURA Community! Happy 2018 to the PURA Community! We wish all of you a year filled with health and happiness! 2018 is just ahead – PURA Vida everyone! We hope you are enjoying a few days off. It has been a great year for the PURA coin. We set off with the release of PURA Dawn and launched our website including our PURA Blog, the BlogChain. We introduced PURA payment solutions for our merchant network.This way our partners all over the world are beginning to accept PURA as payment. This is another step in paving the way towards mass adoption. The PURA team keeps you up-to-date on all the latest developments, such as the release of our PURA Whitepaper about a month ago. In this fashion, our efforts and dedication are now completely geared towards our latest innovations in AI and the release of PURA Aurora. Look out for our innovations coming up in 2018! All of us are living in the high-speed times of blockchain technology and constant developments. Still, we cannot lose sight of the fact that a lot of things need to change. In light of this, we have to ensure society takes on its responsibility and undertakes every effort sustain the very foundations of our planet and humanity. PURA is crypto coin with a vision for a world of fairness and democratic freedom. With this intention, we want to bring forth a decentralized global community of collaborators. 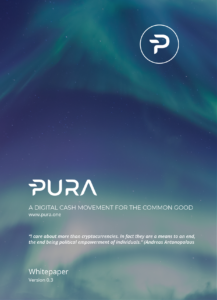 PURA is set to become the first coin to fund and track sustainable, environmental and social projects around the globe, with 10% of all PURA created automatically contributed to the common good. In this spirit, we want to thank you all for your continued support and loyalty. We are certain that the year ahead will be the year of PURA! All the best wishes to all of you, health, happiness and success in 2018!